Quality web marketing packages are extremely important to ensuring the success of your website. Beating out the competition: With a quality web marketing package, you can start beating out some of the competition sites within your niche. Websites that are more popular are visited much more regularly. By making your website more popular with ongoing marketing campaigns, it’s possible to start ranking high on local search engines. Return on investment: Investing in a social media campaign or a search engine marketing campaign can often offer an incredible return on investment. 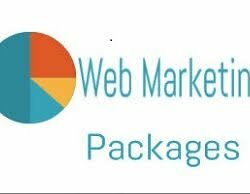 Spending a small amount of money upfront for a web marketing package could be the secret to generating hundreds of dollars in ad revenue or thousands of dollars in sales. It’s heavily targeted: Web marketing packages through a proper Web marketing strategy will target specific markets within your niche. By identifying your target market and advertising directly to them; it’s possible that you can maximize the budget. Working with a professional makes this a real possibility. Brand recognition: A high impact web marketing package will ensure that your branding can consistently be recognized through many online sources. With your brand and your logo consistently spreading across many online sources, you can work at expanding your reach over time.